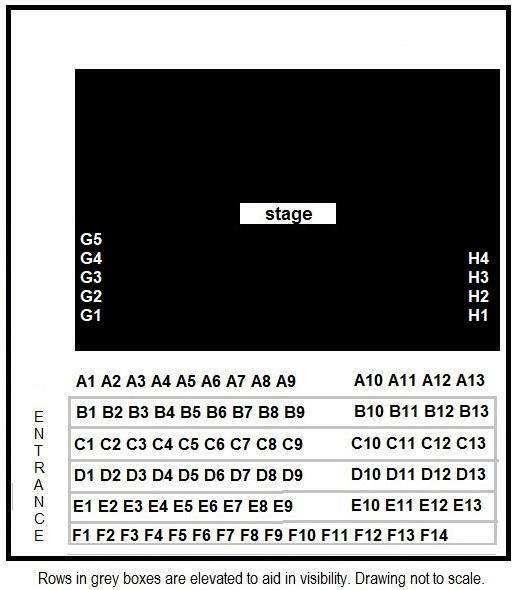 "Below is the seating chart. To my right, (or to your left since you are facing the screen) is a photo of Jessica, Jojo, Jana, Jill and Jenny checkin' out the sturdiness of our table. They are pro's so I don't suggest you trying this at home. You'll be sittin' in chairs. Once you sit down they ask that you don't stick your foot out onto the stage and make them dancers trip while they twirl -even though it might be funny." The maximum capacity for the theatre space is 88 seats. There are no obstructed views Rows B through F are elevated. Rows G & H are on stage with the performers and lit with the rest of the stage. You will also be visited by the preformers from time to time throughout the show if seated in G & H which adds to the fun! We advise you purchase your tickets ASAP. We have 4 handicap seats available. To order handicap seating tickets call 214-477-4942.